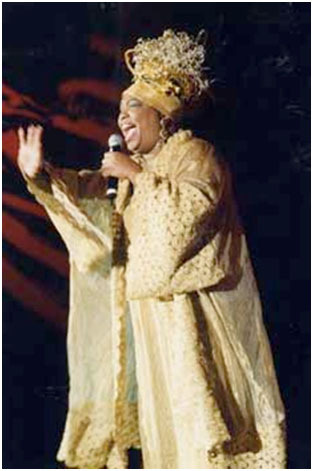 Roslyn Burrough, singer/actress, is the creator and producer of The Auntie Roz Peanut Show. She has received numerous awards for her outstanding work as an artist, educator and mentor. She has appeared in 17 Broadway musicals and received critical acclaim for her performances in The Wiz, Bubbling Brown Sugar, Purlie, Porgy and Bess, The Sound of Music and Comin' Uptown. Ms. Burrough's recordings include Love Is Here, This Little Light of Mine, Steal Away and Touch Somebody's Life. She is a featured singer on My Appreciation (Polygram), produced by Bill Cosby. She has traveled extensively in Africa, Asia, Europe, West Indies and the United States spreading love. Throughout her career, Roz has loved and cared about children. She has developed and used a multifaceted approach to assist with their growth and development. She creates lessons for teachers' manuals and workshops and writes lyrics and music for children's songs. She is a featured singer recorded on Silver Burdett/Ginn's The Music Connection (K-6) and Scott Foreman's Making Music (K-8) textbook series.